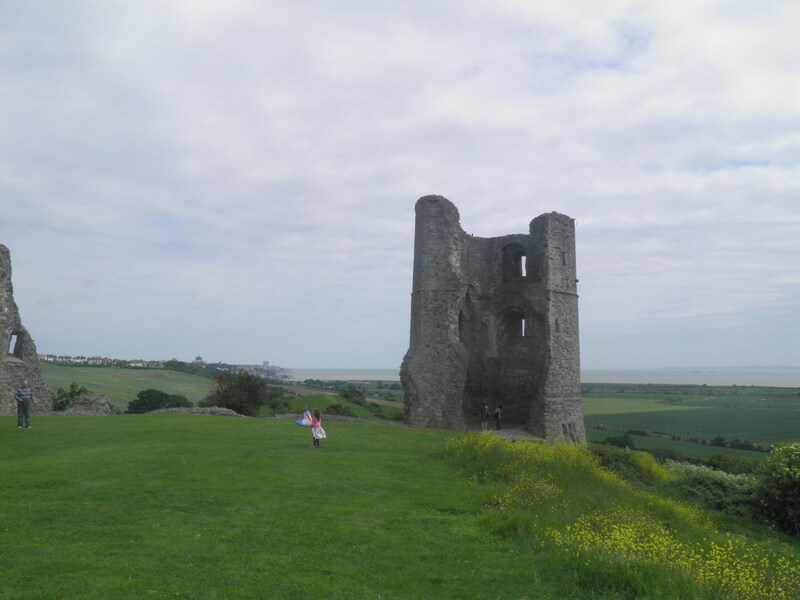 A short stroll through the lush woods of Hadleigh Park high above the Thames-side marshes, climbing to the spectacular ruins of Hadleigh Castle, before a wander through the lovely fishing village of Old Leigh and along the promenade to Chalkwell. Underfoot: Most of the route is on well-constructed paths, with mud unlikely except after heavy rain. Terrain: The first half of the route, through Hadleigh Park has a number of relatively steep, but short ascents and descents. 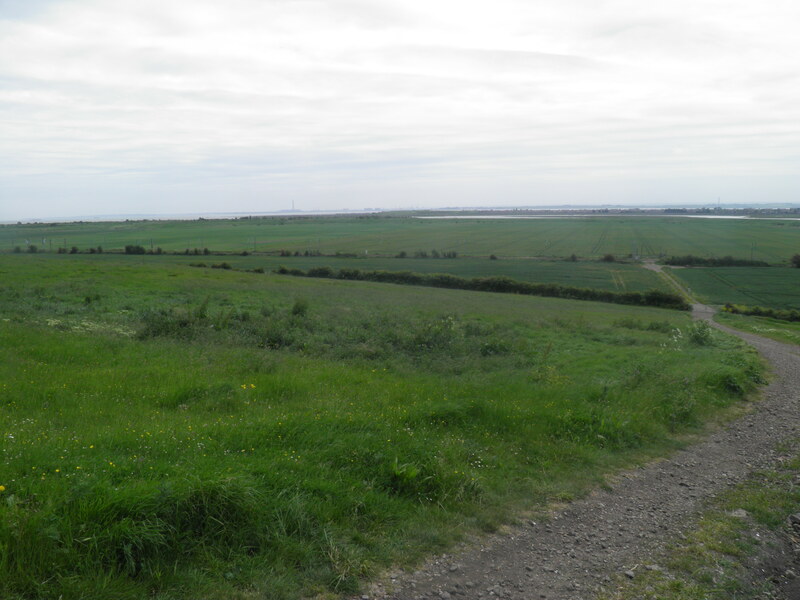 There is a longer, steep descent as you leave Hadleigh Park and then a steep ascent back up to Hadleigh Castle. Maps: 1:50,000 Landranger 178 Thames Estuary; 1:25,000 Explorer 175 Southend-on-Sea & Basildon. Getting there: Benfleet is served by 4 c2c services per hour Monday-Friday from London Fenchurch Street (38-59 mins). All trains call at Limehouse (38-55 mins) for DLR connections, West Ham (30-50 mins) for London Underground and DLR connections and at Barking (25-45 mins) for London Underground and London Overground connections. On Saturdays and Sundays, there are two trains per hour from London Fenchurch Street, via Limehouse and West Ham; and two trains from London Liverpool Street, via Stratford for London Underground, London Overground and DLR connections. All four trains call at Barking. Useful websites: The route passes through Hadleigh Country Park and past the castle itself. 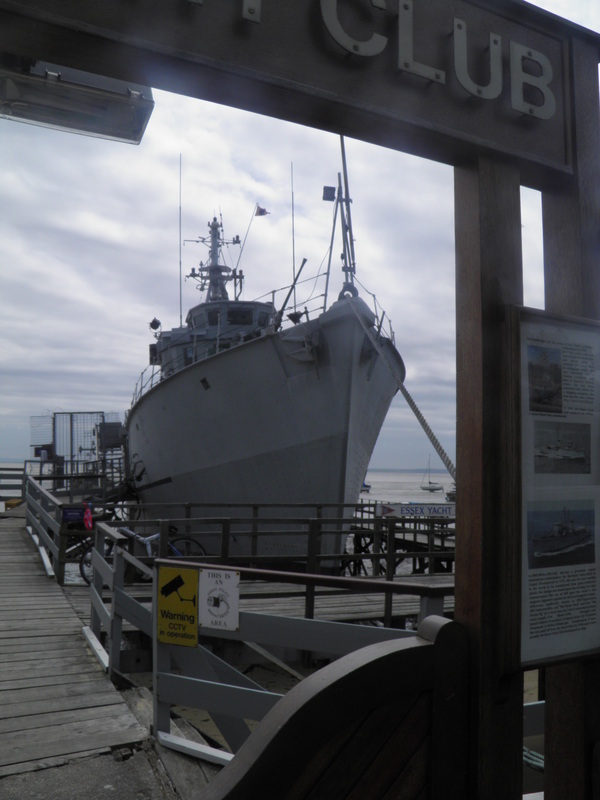 It also passes through the centre of the fishing village of Old Leigh. Getting home: Chalkwell has 4 trains an hour Monday-Friday to London Fenchurch Street (50-69 mins) via Barking (33-52 mins) for London Underground and London Overground connections, West Ham (39-58 mins) for London Underground and DLR connections and Limehouse (47-54 mins) for DLR connections. On Saturdays and Sundays, there are two trains per hour to London Fenchurch Street, via West Ham and Limehouse, and two to London Liverpool Street, via Stratford for London Underground, London Overground and DLR connections. All four trains call at Barking. Fares: The cheapest option is to purchase a super off-peak day return to Chalkwell, which will cover both journeys, for £12.20 (£6.10 child, £8.05 railcard). On exiting the station building at Benfleet, immediately turn left under the railway lines (signed to ‘Taxis’). On the other side of the underpass, turn right, then quickly left, climbing up Station Road. Where the road swings left to become School Lane, take the track to the right, passing through a gate into Hadleigh Park, passing information boards. The Country Park covers an area of downland, woodland, meadows and creekside of significant importance scientifically, and as habitats, including for over-wintering birds, rare invertebrates and butterflies. The country park was established by local authorities in the 1970s, to protect the area from threats including a golf course and a huge housing development planned on land owned by the Salvation Army. In the early 1990s, the Park was again threatened by a scheme – which seems astonishing today – for an elevated road to cross from Canvey Island across the marshes to a roundabout below the castle. The proposal was rejected in 1991. Keep to the main track where it swings left , climbing slightly. The track eventually breaks free of the scrubby trees to emerge on to Benfleet Downs with views over the moorings on Benfleet Creek and to Canvey Island beyond. Canvey Island consists of seven square miles of saucer-flat alluvial deposits, and is now home to over 37,000 people and a large petro-chemical works, never seperated from the mainland by more than a few metres of tidal creeks. Despite this, it was not linked by bridge until 1931 – the bridge you see below replaced the original bridge in the 1970s – allowing the island to develop. Most traffic now crosses via a second bridge, visible to the west. The flat island was one of the areas worst hit by the North Sea flood of 1953, which killed 58 people on the island. At the set of signposts  at the end of the open downland section, take the left hand, higher path, twisting through the woods. Climbing steadily, through several bends, past a bench, you come to the end of a row of houses . Continue to follow the clear path, passing the houses and then turning ninety degrees to the right, to run along the edge of fields, with occasional views across a valley to the water tower in South Benfleet. The path is soon descending again. At a signpost by a path junction, keep straight ahead towards Hadleigh Castle. A few minutes on, a sharp right hand bend in the path leads you onto a steeper descent. 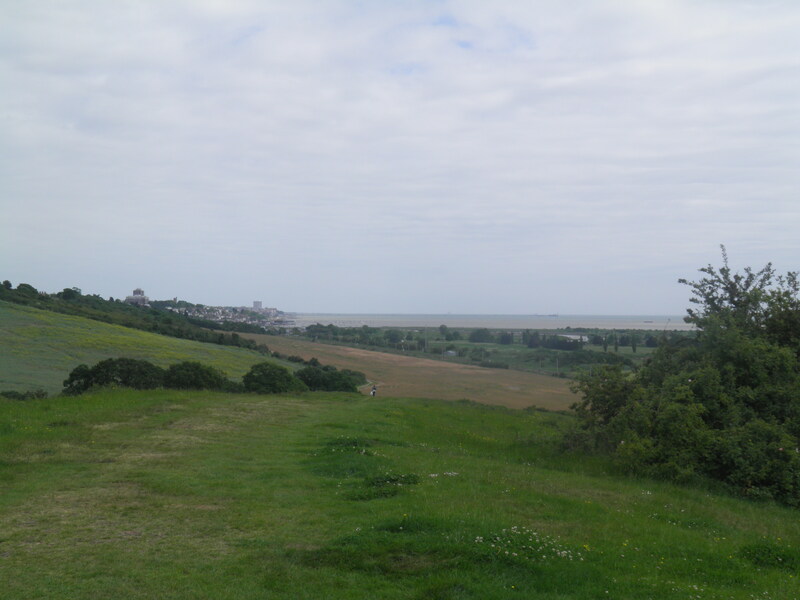 Near the bottom of the drop, take a kissing gate  right into a more open area of down land with huge views over the creek and surrounding flat lands, over to the Thames Estuary itself beyond Canvey Island. Drop to the information board about local wildlife just below and then veer left on a broad grassy path along the hillside. Keep straight ahead on this path, with a wire fence to the left, until it descends to a complex set of gates at the bottom of a small valley . Ignore the two gates to the right in the bottom of the valley and keep ahead to a kissing gate leading out onto a gravel cycle and foot path, next to a sign about the conservation area and the red poll cattle that graze here. Head right along the cycle path (sign to visitor centre and Hadleigh Castle), crossing the valley and then climbing quite steeply. At another complex path junction  near the top of the hill, turn right through a kissing gate out onto the downland again. Immediately veer left to a bench on the top of the hill and continue on the path ahead, dropping gently past further benches. By the third bench, turn left through the kissing gate , recross the cycle path and pass through a second kissing gate opposite. The path drops slightly to a tiny bridge, then climbs to a further kissing gate and a junction. Keep straight ahead, on the grassy verge of a mountain bike track. Ignore the various tracks off on both sides and climb the slope ahead (follow the wooden steps beside the bike path). At the summit, you reach a bench with another fine view . Take the grassy path straight ahead, dropping slightly. fence, by a wicker sculpture . Follow this path down the slope (there are wooden handrails on the steepest bits). On reaching a broad, gravel path, turn left – the track almost immediately swings sharply right and you continue ahead on the narrow path dropping towards the railway line below. At the junction at the bottom of the hill, cross the mini cattle grid ahead and swing left on the clear path towards Hadleigh Castle, soon visible on the hilltop ahead as you cross another cattle grid. Keep to the broad path along the field edge, ignoring the first path to the left. Just before you pass below the castle, pass through a kissing gate to the left (signed to the castle and the rare breeds centre) and cut ahead to join a climbing track. Turn left along the track, quite steeply uphill. 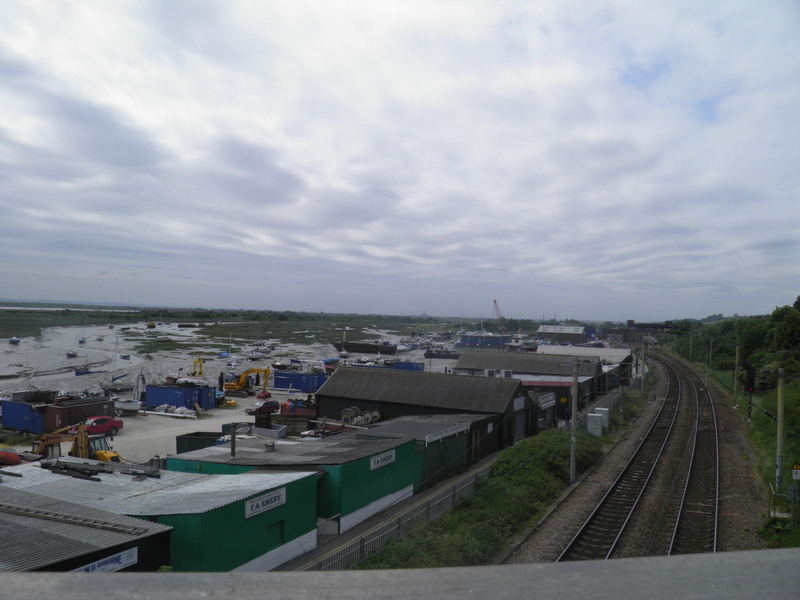 Behind you, a panorama opens up of Canvey Island, the Thames estuary and the Isle of Grain. At the brow of the hill, just after a gate, turn sharp right to enter the fenced ruins of Hadleigh Castle. 1215 – the Thames would have lapped at the bottom of the hill on which it stands. When de Burgh fell out of favour in 1239, the castle became royal property, but little attention was paid to it until the threat from France in the first half of the 14th century convinced Edward III to significantly expand and modernise the castle as part of a defensive network for London. The castle formed part of the dowry of three of Henry VIII’s wives, but by the mid-16th century the castle was falling into disrepair and the estate was broken up. The castle is built on an unstable ridge of London clay, and slippages have frequently taken more of the remains of the castle with them. Today, parts of two towers and the curtain wall remain. Having explored the site, leave the site by passing between the two towers. Immediately drop left to join a path descending beside a metal fence. This leads to a pair of kissing gates – pass through both gates, and continue ahead along a grassy ridge towards the houses of Leigh-on-Sea. The path descends steadily to a pair of kissing gates . From here keep ahead on clear path alongside the hedgerow at the foot of hill. The path climbs slightly again, running a little above the railway to eventually enter a small patch of woodland and join a busy road. station. At a mini-roundabout just beyond , veer right on Belton Gardens, running above Leigh Marina. After a slight curve veer right again  on a road over the railway bridge (marked as a dead end), noticing the line of cockles stalls beside the railway. 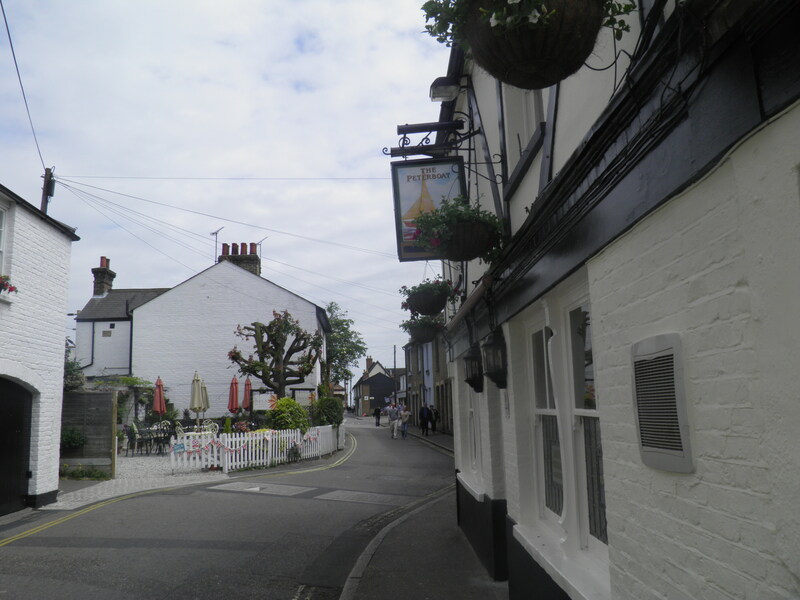 At the bottom of the descent from the bridge, keep straight ahead past the Crooked Billet pub along Old Leigh’s attractive High Street, lined with pubs, tea rooms and fresh seafood stalls. situated on the hills above, separated from Old Leigh by the London-Southend railway line, built in 1854. Leigh originally grew up as a major port for London, rising to a peak of prosperity in the 16th century. However, as ships became larger, Leigh could not cope and its main channel was allowed to silt up, meaning that from the 18th century it reverted to a fishing village, supplying the London markets, being particularly noted for cockles. At the end of the road beyond Leigh Sailing Club, keep straight ahead on the tarmac path along the promenade, between beach and railway line. Continue along this path all the way to Chalkwell, past Essex Yacht Club, with the beached HMS Wilton as its clubhouse. HMS Wilton was built in 1970s as a prototype minesweeper, and had the distinction of being the first warship in the world to be built of glass-reinforced plastic, earning her the nickname ‘HMS Tupperware’. 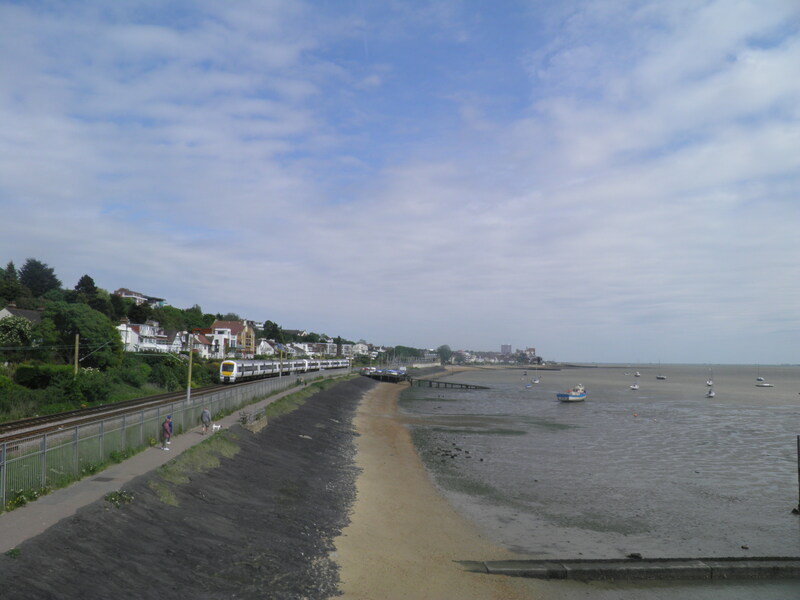 Walk past the wall behind the platforms at Chalkwell station – there is no direct access from the promenade – then veer left up a rising path and round a corner to a footbridge over the railway. The station entrance is immediately to the left at the other side of the bridge. Followed the walk from Benfleet until we were opposite Hadleigh Castle – but there seemed no way to cross to the railway crossing. We just carried on to Leigh. It was a lovely walk. Will return for the Castle. Sorry you couldn’t find the route to the castle – I will have to re-walk this one soon and see if there’s a problem or if the description can be clearer. There are sometimes issues with flooding between the river bank and the railway here which might have barred the way. Walk on past where you feel you should leave the track to go up to Hadleigh Castle. There is a Cafe with seating outside, I believe by a golf range. The oath over the railway is to the East of the cafe. Happy walking.